B.T. Enterprises, Inc. Your #1 Source for alternative fuel! 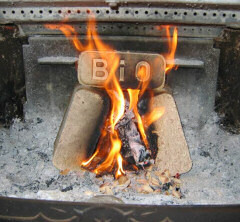 One ton of our BioBricks ® brings as much heat into your house as one cord of wood *. That's one4' x 4' x 3' pallet of BioBricks replacing a 4' x 4' x 8' stack of cordwood. 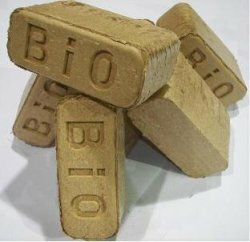 Like Wood Pellets, BioBricks are cheaper than fuel oil, less polluting and greenhouse gas neutral, recycling the C02 that the tree absorbed in its life. Did you know that a typical New England house burning fuel oil generates 5 tons of new green house gas per year? BioBricks make for a cozy evening fire that can last for 6-8 hours per 38 lb pack. Build a teepee around newspaper or fire sticks & establish a strong bed of coals. This is the first step in firing any type of wood stove or fireplace. Burning Bio Bricks in stoves with rear combustion chamber: Push coals into mouth with of rear combustion chamber covering it as much as two-thirds (2/3rds). Build a wall of bricks in front of and over coals packing bricks as tight together and laying them as flat as possible. Stay behind fire irons with fuel. Stoke fire by leaving door cracked. Once fire is going well close damper to direct airflow through mouth of rear combustion chamber. Building Bio Bricks in Catalytic stove or stove with combustion air tubes in firebox: Start teepee in firebox to establish strong bed of coals. Push coals to back corner of stove and build wall in front and over coal bed, laying bio bricks flat and tight together. Alternate stacking "BIO" insignia facing forward and sideways to further cut down on airflow through stack. Always maintain some flame in the firebox. You need to burn the smoke (with flame) in order to extract heat from the wood. You should see little or no smoke in the chimney. NEVER OVERFILL! Copyright © 2004 - 2019 B.T. Enterprises, Inc.